Sony NEX-VG10 comes as a DSLR with interchangeable lens to capture 24Mbps AVCHD video in 1920x1080 60i or 50i. It may confuse some consumers that the 60 / 50i video is created from 30 / 25p sensor output. The 50i and 25p specification is for PAL model, while the 60i and 30p is for NTSC model. Nevertheless, Sony NEX-VG10 provides good image quality and the size is small comparing to other DSLR cameras. With the Windows computer, you can use the bundled Picture Motion Browser (PMB) to download AVCHD videos from camera to computer and play the recorded HD videos. However, for Mac users, there is no bundled Mac software. Aunsoft Video Converter for Mac is the recommended Mac Sony DSLR video converter for you to make Sony NEX-VG10 AVCHD compatible to Mac computer with QuickTime Player. 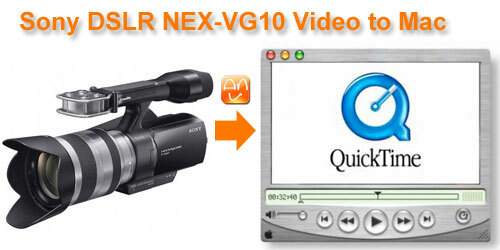 It can convert AVCHD to MOV and deinterlace 1080i AVCHD for smooth playback on Mac. If you have Sony DSLR or Canon DSLR to record AVCHD videos, you may have a look at the following steps to convert AVCHD to Mac compatible MOV for QuickTime Player. Step 1. Load Sony AVCHD files to Aunsoft Video Converter for Mac. Connect Sony NEX-VG10 camera to iMac USB port, find the .mts files from the camera folder like PRIVATE > AVCHD > BDMV > STREAM and copy the .mts files from camera to the Apple hard drive disk. Run Aunsoft Video Converter for Mac as the best Mac video converter for Sony NEX-VG10, and click the "Add" button to load AVCHD .mts videos. Step 2. Choose HD MOV output format. Click the "Format" option and navigate the mouse cursor to HD Video > H.264 HD Video(*.mov) as output format. The Mac Sony video converter will convert NEX-VG10 AVCHD to Mac compatible MOV with 1920x1080 as default video resolution. Step 3. Deinterlace Sony NEX-VG10 video. Select a video clip on the file list, click the "Editor" and go to the Effect tab. Check the box for deinterlacing and click the apply to all button. The Mac Sony video converter will deinterlace NEX-VG10 1080i videos for playback on computer without unexpected lines. Step 4. 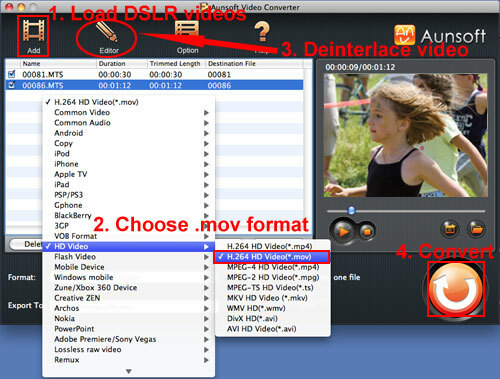 Convert Sony DSLR video to MOV for Mac. Click the convert button under the preview window, and the Mac Sony video converter will start the conversion from Sony NEX-VG10 to MOV for QuickTime Player on Mac with smooth playback. If you are looking for solutions to the Mac compatibility problem of your Sony camcorders and cameras like Alpha NEX-5, Cyber-shot DSC-TX7, DSC-HX5V, HDR-CX350/CX550, HDR-XR520/XR550, you may be interested in the Aunsoft Sony camcorder column. How to Convert Videos and Blu-ray DVD for iPhone 4?